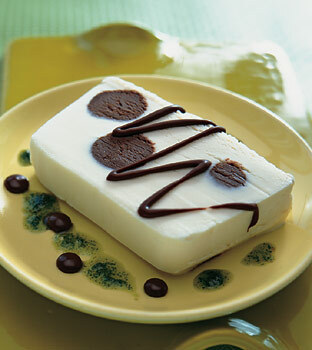 Mint-chocolate truffles frozen in vanilla ice cream create a polka-dot dessert. The ganache makes the truffles as well as the sauce, making this easier than it looks. This showstopper graced the cover of the April 2005 issue of Bon Appetit. Note that the BA test kitchen used a loaf pan with angled sides to form the dessert. If you can find the straight-sided loaf pan as suggested, I think it even looks better. The idea for this dessert was initially visual. I had this concept of creating a dessert with contrasting colors and shapes and I thought of polka dots in food form. Being as chocolate focused as I am the idea of small, round truffles immediately popped into my mind’s eye and the dessert fell into place. Combine sugar and water in a small saucepan, stir to wet sugar, then bring to a boil over medium heat, swirling pan once or twice to dissolve sugar. Remove from heat and cool 5 minutes. Place sugar syrup and mint in blender and blend until mint is very finely chopped and evenly suspended within syrup. Cool to room temperature. Place in squeeze bottle and chill before using. Sauce may be made a day ahead. Place the chocolate in a heat-proof bowl. Bring cream to a boil and pour it over the chocolate. Let sit a few minutes, then whisk gently until chocolate is melted. Whisk in peppermint flavoring. Cool to room temperature. Freeze until firm, at least 4 hours or overnight. Dust hands with cocoa and roll chilled mixture into 1-inch balls. Set aside in freezer until needed. Line a 6 cup, 8 by 4-inch straight sided loaf pan with plastic wrap. Use one large, long piece and make sure that ends extend over the short sides, smoothing the rest down into the pan as well as you can. Pack about a third of the ice cream into the bottom of the loaf pan, making an even layer. Arrange truffles hear and there, embedding them in the ice cream, but not touching each other. Cover with another third of the ice cream and place remaining truffles in ice cream, again not touching any of the others. Cover with remaining ice cream, smoothing top. (If there are leftover truffles, store in airtight container in freezer and serve with espresso). Cover with additional plastic wrap and freeze overnight. Right before serving, To serve, cut into 12 slices using a thin-bladed sharp knife dipped in hot water. Place each slice on serving plate and serve with mint sauce. Serve immediately. Tip: Soften the ice cream by microwaving it in ten-second intervals on the lowest power setting.